The acetylation post-translational modification (PTM) of tubulin occurs primarily on the lysine at position 40 (Lys40) on the alpha-tubulins of assembled microtubules (MTs)1-3. The predominant alpha-tubulin acetyltransferase is TAT1/MEC-174,5. Deacetylation of acetylated tubulin is mediated by histone deacetylase 6 (HDAC6) or SIRT2, the mammalian homolog of silent information regulator 2/sirtuin type 26,7. Lys40 has long been considered the sole site of acetylation and while other lysine residues on alpha-tubulin and beta-tubulin are targets for acetylation based on proteomic analyses, functional studies focus on the Lys40 residue within the MT lumen2,8,9. 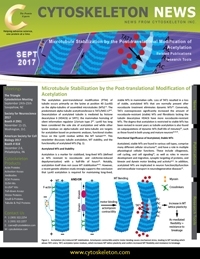 This newsletter discusses tubulin acetylation, MT stability, and the functionality of acetylated MTs (Fig. 1). Acetylation is a marker for stabilized, long-lived MTs (defined as MTs resistant to nocodazole- and colchicine-induced depolymerization) with a half-life of hours10. Notably, acetylation itself does not cause MT stabilization10-15. However, a recent genetic ablation study strongly supports the conclusion that Lys40 acetylation is required for maintaining long-lived, stable MTs in mammalian cells. Loss of TAT1 resulted in a loss of stable, acetylated MTs that are normally present after nocodazole treatment eliminates dynamic MTs16. Conversely, TAT1 overexpression significantly increased the amount of nocodazole-resistant (stable) MTs and fibroblasts lacking the tubulin deacetylase HDAC6 have more nocodazole-resistant MTs. The dogma that acetylation is restricted to stable MTs has been revised in recent years as tubulin acetylation is also found on subpopulations of dynamic MTs (half-life of minutes)14, such as those found in both young and mature neurons6,14,15. Figure 1. Acetylation (Ac)-induced MT stabilization. Actomyosin contractility and/or motor binding causes mechanical stress, leading to MT bending which allows TAT1 entry. TAT1 acetylates lysine residues, which increases MT lattice plasticity and confers increased MT flexibility and resistance to breakage. Acetylated, stable MTs are found in various cell types, comprise many different cellular structures14, and have a role in multiple physiological cellular functions. These include ciliogenesis, cell cycling, and cell signaling14, as well as roles in neuron development and migration, synaptic targeting of proteins, and kinesin and dynein motor binding and activity6,14. In addition, acetylated MTs are implicated in neuron function/dysfunction and intracellular transport in neurodegenerative diseases14. Despite all of these physiological studies, the functional significance of acetylating long-lived, stable MTs remains undefined. There are conflicting results regarding the role, if any, acetylation has in tubulin polymerization. An early study found no effect of acetylation on depolymerization or polymerization17. Similarly, loss of TAT1 in retinal pigment epithelial cells did not significantly affect MT polymerization or organization16. Alternatively, a recent study18 found acetylated tubulin heterodimers display a decreased rate of spontaneous nucleation, resulting in self-assembly significantly slower than deacetylated tubulin18. Single MT dynamics revealed that acetylation conferred no change in growth rate, but acetylated MTs depolymerized faster than deacetylated MTs18. The changes in nucleation and self-assembly were due to acetylation-stimulated disruption of lateral interactions between protofilaments18, which resulted in reduced nucleation rates and accelerated shrinkage (depolymerization). Acetylation-mediated effects on protofilament interactions underlie the role acetylation has in the response of stable MTs to mechanical stress (Fig. 1). Long-lived, stable MTs undergo buckling due to mechanical stresses such as compression from binding of kinesin and/or dynein motors and actomyosin contractility19,20 (Fig. 1). Acetylation protects MTs from mechanical stress in vitro18, suggesting that localized acetylation protects stable MTs from mechanical stresses such as bending under compression16. In TAT1-deficient cells, long-lived MTs were reduced due to increased breakage under mechanical stress. The primary source of compression was from Rho/ROCK-mediated actomyosin contractility following nocodazole-induced MT depolymerization16,21; motor binding was also a factor. Acetylation mechanically stabilizes MT through a reduction in MT flexural rigidity (i.e., bending resistance) through a weakening of inter-protofilament interactions18. This increases the plasticity of the MT lattice, thereby reducing the extent of damage induced by repeated mechanical stress (Fig. 1). In MT segments that bend, there are lattice openings and under mechanical stress/compression, an opening (or openings) may develop that allow TAT1 entry into the MT lumen where acetylation of alpha-tubulin within the bend (i.e., region of MT undergoing stress) occurs, which protects the MT at this vulnerable point16,22. Once inside the MT lumen, the mobility of TAT1 is controlled by TAT1 affinity for acetylation target sites and their corresponding accessibility and localization within the lumen22 (Fig. 1). Tubulin acetylation is found within a wide variety of cellular structures and cell types and has been implicated in a myriad of complex cellular functions, including the response to mechanical stresses applied to stable MTs. Cytoskeleton Inc., offers reagents for studying the levels of endogenous PTMs such as acetylation within cells in a sensitive and quantitative manner using the Signal Seeker™ Acetyl-Lysine Enrichment Kit. In addition, there are Enrichment Kits for tyrosine phosphorylation, SUMOylation, and ubiquitination. For more information, please contact one of Cytoskeleton’s technical support scientists at signalseeker@cytoskeleton.com or tservice@cytoskeleton.com. Wloga D. and Gaertig J. 2010. Post-translational modifications of microtubules. J. Cell Sci. 123, 3447-3455. Janke C. and Kneussel M. 2010. Tubulin post-translational modifications: encoding functions on the neuronal microtubule cytoskeleton. Trends Neurosci. 33, 362-372. Hammond J. et al. 2008. Tubulin modifications and their cellular functions. Curr. Opin. Cell Biol. 20, 71-76. Akella A.J. et al. 2010. MEC-17 is an alpha-tubulin acetyltransferase. Nature. 467, 218-222. Shida T. et al. 2010. The major alpha-tubulin K40 acetyltransferase alphaTAT1 promotes rapid ciliogenesis and efficient mechanosensation. Proc. Natl. Acad. Sci. U.S.A. 107, 21517-21522. Fukushima N. et al. 2009. Post-translational modifications of tubulin in the nervous system. J. Neurochem. 109, 683-693. Garnham C.P. and Roll-Mecak A. 2012. The chemical complexity of cellular microtubules: Tubulin post-translational modification enzymes and their roles in tuning microtubule functions. Cytoskeleton. 69, 442-463. Nogales E. et al. 1998. Structure of the alpha beta tubulin dimer by electron crystallography. Nature. 391, 199-203. Palazzo A. et al. 2003. Tubulin acetylation and cell motility. Nature. 421, 230. Li R. and Gundersen G.G. 2008. Beyond polymer polarity: how the cytoskeleton builds a polarized cell. Nat. Rev. Mol. Cell Biol. 9, 860-873. Piperno G. et al. 1987. Microtubules containing acetylated alpha-tubulin in mammalian cells in culture. J. Cell Biol. 104, 289-302. Wilson P.J. and Forer A. 1997. Effects of nanomolar taxol on crane-fly spermatocyte spindles indicate that acetylation of kinetochore microtubules can be used as a marker of poleward tubulin flux. Cell. Motil. Cytoskeleton. 37, 20-32. Perdiz D. et al. 2011. The ins and outs of tubulin acetylation: More than just a post-translational modification?. Cell. Signal. 23, 763-771. Witte H. et al. 2008. Microtubule stabilization specifies initial neuronal polarization. J. Cell Biol. 180, 619-632. Xu Z. et al. 2017. Microtubules acquire resistance from mechanical breakage through intralumenal acetylation. Science. 356, 328-332. Maruta H. et al. 1986. The acetylation of alpha-tubulin and its relationship to the assembly and disassembly of microtubules. J. Cell Biol. 103, 571-579. Portran D. et al. 2017. Tubulin acetylation protects long-lived microtubules against mechanical ageing. Nat. Cell Biol. 19, 391-398. Bicek A.D. et al. 2009. Anterograde microtubule transport drives microtubule bending in LLC-PK1 epithelial cells. Mol. Biol. Cell. 20, 2943-2953. Gupton S.L. et al. 2002. Converging populations of f-actin promote breakage of associated microtubules to spatially regulate microtubule turnover in migrating cells. Curr. Biol. 12, 1891-1899. Chang Y.C. et al. 2008. GEF-H1 couples nocodazole-induced microtubule disassembly to cell contractility via RhoA. Mol. Biol. Cell. 19, 2147-2153. Coombes C. et al. 2016. Mechanism of microtubule lumen entry for the a-tubulin acetyltransferase enzyme aTAT1. Proc. Natl. Acad. Sci. U.S.A. 113, E7176-E7184.